This past weekend yielded some enormous takes, with the top two attractions each attracting over a million viewers. The result was a massive weekend with 2.9 million tickets sold versus lat year's already enormous 2.25. The domestic market share was also significantly better with 43% versus last year's 27%, not an enormous percentage but still very strong for the time of year, which is typically dominated by Hollywood. Coming in at number one was the hotly anticipated zombie thriller Deranged though I never would have guessed that it could muster over a million let alone 1,128,335 admissions during its debut. 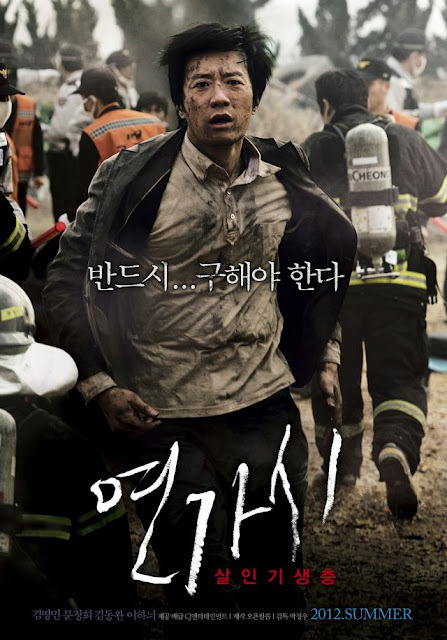 Profitability is assured but like all Korean films, word of mouth will be key and it will be interesting to see if it can capitalize on its great start or turn into another Sector 7. Following its own massive opening The Amazing Spiderman had an impressive sophomore stint as it slowed a mere 30% for 1,059,076. The film seems to be underperforming slightly during it July 4th US debut but here in Korea it's well on its way to crossing the 5 million admissions mark. Another new film took the third slot, the Japanese animation A Letter to Moto which bowed with 102,728. A decent number for this kind of release but clearly a drop in the bucket following the first two films. Madagascar 3 is still hanging in there after an 83,087 frame while both The Raven and Midnight in Paris posted so-so debuts with 65,946 and 61,735 respectively. All About My Wife and The Emperor's Concubine are finally starting to slide down as they earned 56,070 and 44,226, though the former was only cut in half versus the latter's 65% decline. Haywire had a miniscule debut with 26,675 while Cabin in the Woods crumbled in its second weekend, posting a meager 20,773 after a large 80% drop. An enormous amount of films are crowding the theaters next weekend but there's nothing really major. The biggest are the Korean comedy Dangerously Excited, which deserves an audience but will likely open somewhere on the middle of the chart, and Two Moons a new K-horror which already looks D.O.A. The real question is which of this week's dynamic duo will take the crown, hard to call now but I think Spiderman might edge the zombies out. But we'll see what happens!